After teaching math at a community college for 10 years (and using online homework for at least 7 of those), I have noticed that my online math students don’t seem to have the same grasp on notation and the steps to “prove” the solution to a problem as when they did old-fashioned paper & pencil homework. I have also found that the students who use online homework have become much more unorganized, and are unable to find the work for the problems they have questions on. This last year, I’ve been experimenting with what I call a “Learning Notebook” – where students keep an organized notebook of the handwritten work for selected problems from the online homework system. In these Learning Notebooks, the students have to show the steps required to complete the required problems (including all necessary graphs and proper notation). They don’t have to keep a record of every problem, since some questions can be answered by inspection alone. For the Learning Notebook, I typically choose problems that would require me to show steps in order to complete it with a reasonable confidence in my answer. The online homework, graded on accuracy, is worth 20 points per unit. The Learning Notebook, showing sound mathematical thinking and notation for required problems, is worth an equal weight of 20 points. When studying for an exam, the student can find the work associated with each problem quickly. When there’s a question on a specific problem, the student can quickly find their version of the problem and what they tried. Repetition of the use of proper notation leads to better outcomes on the exams (since they don’t “forget” to include the notation there when they are required to have it in their notebooks). Thoughtful reflection on the problem steps may be more likely when they slow down to write the steps down instead of trying to do too much in their head. Students get points for showing their work, which can act as a slight padding of their grade when the tests are hard (which they inevitably are). A collection of Learning Notebooks on exam day. For my traditional classes (that include an in-person meeting) I grade the Learning Notebooks while the students give the exam. 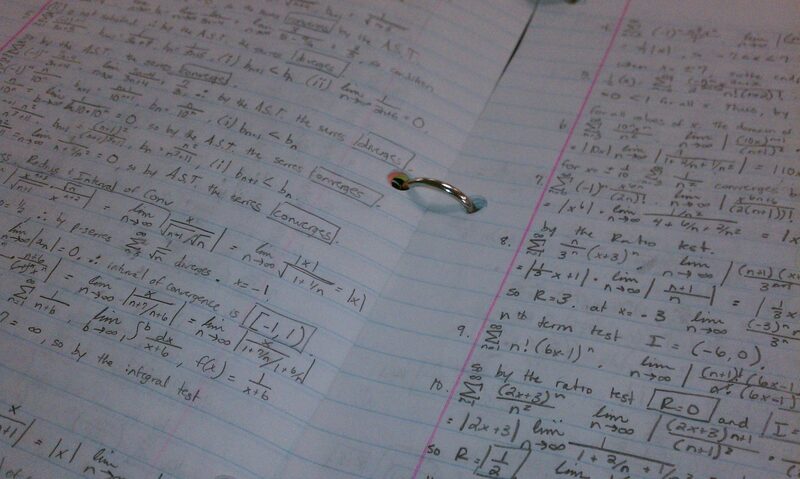 I select ten problems at random to check for completion, notation, and supporting steps. 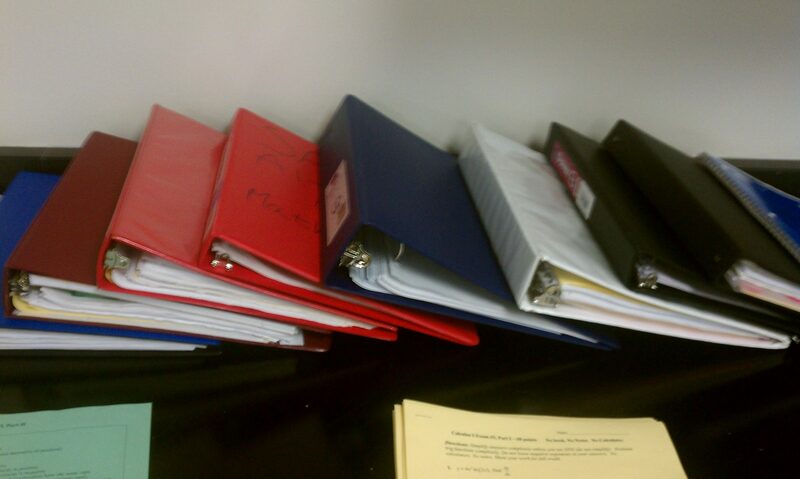 I typically give a 2-hour exam, and I can grade the notebooks for 15-25 students by the end of that time. This is when it becomes vitally important to me that the students include a Table of Contents and numbered pages. Without those, I would spend a lot of extra time searching for assignments. I use a 0-1-2 point scale for each of the ten problems. After I have worked through all 10 problems, I give the student a score out of 20. To help you understand the process a little better, I asked a few students to let me share their notebooks and the grading process. They agreed, so here’s a little video explanation of how the process works. Here is a Sample Table of Contents and Sample Notebook Check for the Learning Notebooks. Because they have to keep a Learning Notebook, students know that they shouldn’t cut corners when they work through problems. At first, many will try, rushing through the online homework (probably with the aid of calculators and WolframAlpha) with the belief that they will just “take a few minutes to go back and write up the steps.” For this reason, you shouldn’t be surprised if the grades for the first set of Notebooks are pretty bipolar (half will be great, half will be awful). It turns out that to actually think through and write the math takes time, time that some of these students have been cutting corners on ever since online homework was first introduced. I’ve been using these notebooks in Math for Elementary Teachers, College Algebra, Calculus I, and Calculus II over the last year, and have seen an improvement in mathematical thinking, use of notation, and study habits for those students that keep good notebooks. I don’t have any scientific evidence, but overall, I feel like these Learning Notebooks are helping improve my students’ success. NOTE: In about a week, I will share how I’m using the same strategy in my online classes. I want to get all the way through the process of collection once before I write about it. Hint: It involves webcams and cell phone cameras.